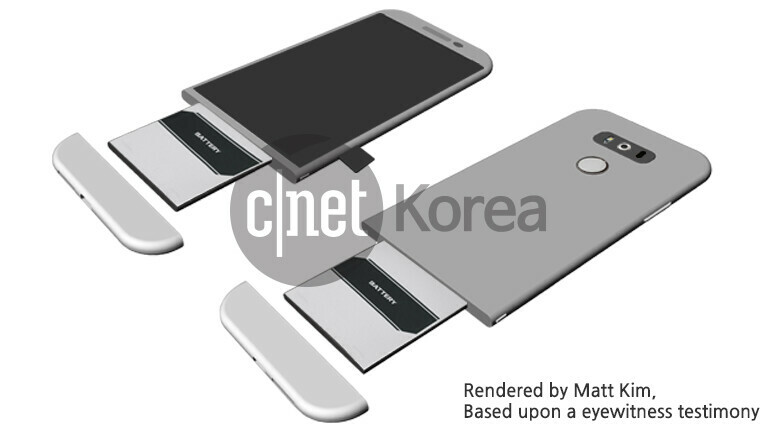 Fed up with LG G5 leaks and rumors? You better not be, as we have a brand new one for you, and my, what a leak that is! Just yesterday, thanks to one of the most legit-looking leaks until now, we got to see the back and front of LG's next flagship, but one thing we couldn't ogle at was the rumored Magic Slot at the bottom of the phone. It is speculated that this curious expansion slot will enable G5 users to insert different modules or slots inside the phone, ranging from regular and extended batteries to other accessories that might further expand the functionalities of the flagship. Until now, said Magic Slot only existed on sketches based upon an eyewitness testimony (check the picture on the right), but new real-life pictures claim to show a G5 with a peculiar module inserted in it. In particular, the G5 itself falls in line with all the previous leaks of the phone, assuring us that it is the real deal, though the bulky module is what is raising our eyebrows. Check it out right below. Now, we are certain that one specific question has popped in everyone's minds: "What is this?". The attached module doesn't look like your regular extended battery unit, that's for sure. We can see a dial in the corner, a button on one of the sides, either a button or a 3.5mm headphone jack on the other side, and what look like a USB slot of sorts, either a USB Type-C or a regular micro-USB one. The module is not an external camera one, as there is no camera sensor in sight. However, we only get to see the module from one angle, which leaves a lot of room for speculation. Could it house a projector? Could it be a camera grip? The blurry photo does not shine light upon that mystery. The plot thickens, but hopefully, we won't have to wait long for LG to spill the beans. We are merely days before the announcement of the phone. Are you excited? Feb 16, 2016, 3:42 AM, by Peter K.
The first attempt may be ugly, but I think it's a positive direction towards some innovative ways to bring in more add on functionalities to the mobiles. BTW anyone feeling that the expectation towards LG5 being a gamechanger for LG has taken a hit after the last two ugly pics in leaks? For me personally, yes, these ugly images have hurt my expectations for now. But that can easily be rectified if the device looks good when it's officially unveiled. I dont see it ugle.the picture that have been leaked has been blurred intentionaly for some reasone. the reason is because the one who took the picture doesn't know how to take a proper photo? Haha and flat b**bs, look at the dual lens. should rename it to "LG G5 Quasimodo edition". Is that the cousin of the battery pack/case made by Apple? Maybe it's some sort of 'Survival Pack'? And maybe they will release a bunch of different modules to suit different activities... If you look at the camera bump, it's decreased a lot which means that this is a case with the module on the bottom, which could mean it's a super durable case thingy majiggy, too... Would be pretty cool, certainly makes up (a little) for such an ugly device, but still wouldn't buy one. Is LG even trying at this point? Yesterday's leaks showing the regular G5 weren't that bad (in my opinion) but this is straight up UGLY! I don't think anyone said the concept was useless. They said they didn't like the way it looked. Which is of course subjective... But that particular module is ugly. Call a spade a spade. From anyone else I would have thought it was a prototype, they would be crazy to release something that ugly to consumers. nahh that's not even a good edit! seems like the g5 is very powerful indeed! @$some flagship! ready for combat in fulll battle slot! this looks like a camera grip. it actually has a dial and a camera shutter button. i can't distinguish the two other buttons though! Some kind of modular expansion slot would be interesting but LH like every other major manufacturer wants people to buy a new phone every year so I can't see this doing much. this accesorie its a shotter camera module + battery expansion. its a removible accesorie. As long as this phone has a replacable battery I will be happy. As far as these pics though, it looks dumb, just my opinion.